A few years ago, I read THE DAY THE FALLS STOOD STILL by Cathy Marie Buchanan; and I absolutely adored it -- you can read my review here. I have been anxiously waiting for her next novel THE PAINTED GIRLS for what seems like forever; and I am thrilled to say that it was well worth the wait. In fact, I enjoyed THE PAINTED GIRLS even more than THE DAY THE FALLS STOOD STILL, and that's really saying something. 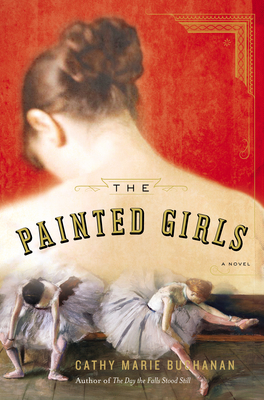 In my opinion, THE PAINTED GIRLS is historical fiction at its very best. This novel which takes place in the late 1870s and early 1880s in Paris is the perfect blend of historical information and a riveting story. It is one of the best books that I've read so far this year (which I realize is only three and a half weeks in), and I'm quite positive that it will go down as one of my top reads for 2013. It's that good. THE PAINTED GIRLS tells the story of the van Goethem sisters -- primarily Antoinette and Marie although there is a third sister as well. After their father passes away, the girls and their mother (who works as a laundress and enjoys her fair share of absinthe) find themselves so poor that they barely have enough food to eat. Desperate, Marie is sent to the Paris Opera for training as a ballerina and Antoinette finds work as an extra in a play. Marie becomes quite the dedicated dancer and even begins modeling for Degas. She even becomes the model for his masterpiece Little Dancer Aged Fourteen. However, she finds that her new life comes with some costs, namely in the expectations of her male patron. Antoinette's life takes a rather different course, She falls head over heels in love with the menacing Emile Abadie, a fellow stage extra who enjoys his fair share of women and alcohol; and her life takes a drastic turn when Emile is accused of some horrible crimes. I hesitate to go into any more details about these sisters' stories because I feel that much more would spoil the beauty of this novel. Suffice it to say that I found everything about this novel to be just about perfect. The characters were so well developed and complex, the setting was vividly brought to life, and the story was incredibly interesting. Needless to say, I absolutely loved THE PAINTED GIRLS. Truly, I can't rave enough about what Ms. Buchanan has created in THE PAINTED GIRLS. I wasn't familiar with this time period or the van Goethem sisters (yes, they are real characters!) in the least; however, after I read this novel, I had to know more. I was also fascinated with her portrayal of Degas. While he wasn't necessarily a major character in this novel, I found his methods to be interesting. After I finished this novel, I did a little reading and found that Ms. Buchanan based this story on very real events -- yes she took some liberties with relationships, but it is a work of fiction!, and I extremely impressed with how well she merged the facts with an enticing story. In addition, I loved the characters that Ms. Buchanan created. That statement pretty much holds true for all of the characters -- the good ones and the bad. Having said that, the van Goethem girls held a special place in my heart. Both girls were far from perfect (in fact, they were extremely flawed), but they were so real. And as far as their relationship with each other, I thought it reflected the ups and downs of sibling relationships -- the love and the rivalry. I could go on and on about so many things that I loved about this book. It really is so much more than just an entertaining story. For example, I loved how the author included so much about the social climate of late 1880s Paris. The exploration of the criminal system, art, theater, poverty, justice and much more were extremely thought-provoking and really helped to make this book extra-special. I also thought the way the story was told (in both girls' voices) was ideal. The author managed to make each girl come alive and have a very distinct voice. It won't come as any surprise to you that I highly recommend THE PAINTED GIRLS for book clubs. I found a terrific reading guide on the author's website with fourteen questions. Some of the themes you might want to explore include Paris in the 1800s, sibling rivalry, poverty, determination, jealousy, crimes, dedication, honestly, sacrifice, addiction, and love. Of course, they are many more topics that warrant some additional discussion. I will be recommending THE PAINTED GIRLS to everyone I meet! In fact, I think my friends are already tired of me talking about this book. It's nothing short of fabulous! Even though I don't read much historical fiction, I'm drawn to this book. I'm not sure if it's the setting or the time period. You've made the book sound fabulous! I received a copy of this book and I'm really looking forward to reading it. Lovely review! Dar is sending me her copy soon and I cannot wait to read it. i'm not a huge historical fiction reader but when the past comes alive like this, it is pretty exciting. Thank you, Julie. This has got to be most generous review of The Painted Girls I've seen. I love it. And thank you, non-historical fiction readers, for your willingness to take the plunge. Yes, that Julie is a convincing reviewer. I have seen lots of really good reviews of this book! I am so excited to see that you loved Painted Girls. I am dying to read it. I love elements of mystery and anything ballet. Thanks for the informative review.